The setup will install the latest eDocPrintPro Toolbox documentation as Readme. New plugin INI parameter – “Temporary=yes” – if this parameter is set in the INI file of a plugin, the PDF file will be created first in the %TEMP% folder. Then all plugins are processed and only then the PDF file is moved to the configured or selected target folder. 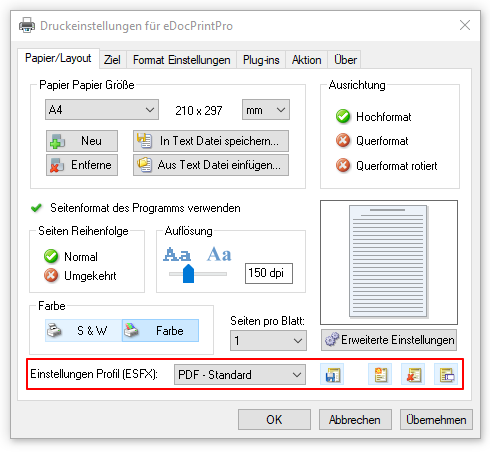 This prevents the PDF file from immediately appearing in the destination folder, the processing with the plugins happening in the destination folder, and the user or another program already opening or locking the PDF file before the plugin processing has been completed. Selected ESFX – profile will be loaded immediately – Previously the ESFX profile hat to be selected and then the “Load” button had to be pressed so that the settings were read in and adopted. Now it is sufficient to select another profile from the list to load and activate the settings. The “Load” button has been removed.